The officer was treated and released but police said in a warrant issued for the arrest of Brad Anthony Williams that the officer "could have easily been killed" because the bullet was below his ballistic vest. However, the bullet struck the officer's taser and lodged in his duty belt. Police responded early Saturday to 4516 Decoursey Avenue for a reported shooting. Officers found a man covered in blood and suffering from a gunshot wound to the ear. Williams was in a rear bedroom and when a responding officer entered, Williams opened fire with a semi-automatic rifle. As the officer backed out of the room after the bullet lodged in his belt, Williams, the warrant states, emerged in the bedroom doorway dressed in camouflage body armor and a camouflage motorcycle helmet. Officers returned fire, striking him multiple times. 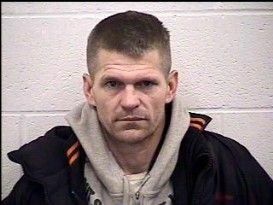 An arrest warrant has been issued for Williams, 41, of Elsmere. Kentucky State Police said that he is at University of Cincinnati Medical Center in stable condition. He faces charges of attempted murder of a police officer, second degree assault, possession of a firearm by a convicted felon, and persistent felony offender. Witnesses told police, the warrant states, that Willaims used the semi-automatic rifle to shoot the first victim in his ear. Williams has a lengthy arrest record in Kenton County dating back to 1995 according to online records. Covington Police were joined at the scene by the Kentucky State Police Critical Incident Response Team and Taylor Mill Police. Kentucky State Police Post 6 - Dry Ridge spokesperson Trooper Charles Loudermilk said that more information will be provided as it becomes available. The state police will be handling the investigation.